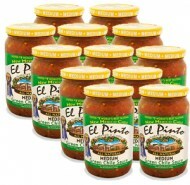 El Pinto Foods LLC offers hot-fill private label production for co-packing clients from our automated manufacturing facility on the property of iconic El Pinto Restaurant in the North Valley of Albuquerque New Mexico. Automated for efficiency for small to mid sized companies • There are bigger co-packers out there that can do a lower price point, but can they do the volume you need? If you have a product in production and are ready to go to the next level, but cannot satisfy the minimums, El Pinto is the niche high quality manufacture you need. SQF Certified • The factory follows SQF 2 certification requirements helping to document product safety, chain of ownership, and allowing your product to be sold in the largest retailers in the nation. Organic Certified • Our corporate culture believes in nutricious and healthy products that nourish the body. Although not everything we manufacture is organic, we do seek partnerships with companies with a similar belief, and provide high quality products to consumers. Nimble • With engineers on staff, and the ability to customize our production line to your needs, we are one of the most nimble companies you will find. Loyal • El Pinto was established in 1962 and has grown into a unique family company with a 1,000 seat iconic restaurant, 20,000 sq foot manufacturing facility, organic green house, and an Animal Welfare Approved laying hen program for eggs, all located on the same 14 acre property in Albuquerque, NM. As a family run business, we maintain loyalty to all of our customers. Efficient • With automation to create 25,000 jars of hot fill production in one shift, we can efficiently produce product for partners from 100,000 to a few million units annually. We have a secondary line for cup/tub product and mechanized support for food service large capacity bagged products. Storage on Site • Raw Goods and Finished Goods Warehouses are on site with shipping daily across the nation.